This colorful maxi is perfect for any Spring and Summer outting. Fit: True to Size. Very stretchy! Dress is unlined. Model Stats: Mack is 5'5.5'' a size 1 wearing a small. Small: Bust 34'' Length 59'' Waist 23"
Medium: Bust 36'' Length 60'' Waist 24"
Large: Bust 38'' Length 61'' Waist 25"
It’s a beautiful dress! And it’s comfortable. Wish it had a liner for the price of the dress. Love this dress. But, the bottom is see through so it needs to be worn with a slip of some kind. Love the long length! 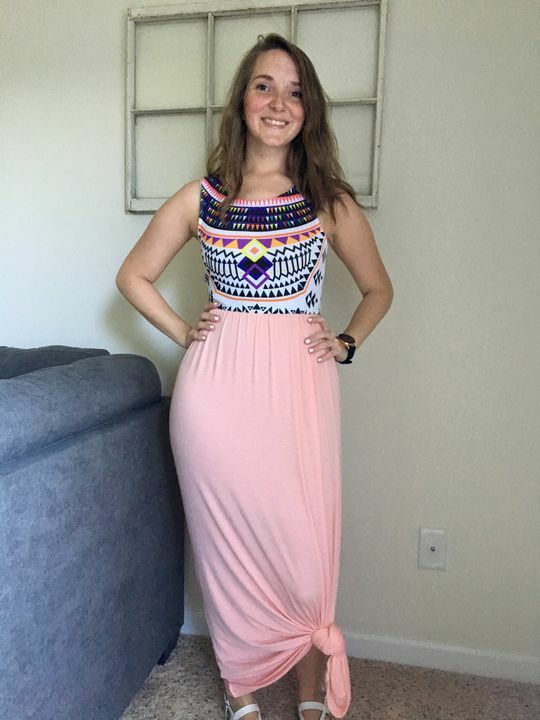 I love the fit of this maxi and the colours are awesome. Fits perfect and it’s so cute on. closet. It is sheer (which is states in the description) so you’ll definitely need some sort of slip underneath. This dress is super soft just a little see thru but can be worn as is & fitting is very flattering. It's a little long side but not too much.